In a large bowl, add 3 Tablespoons warm water, 1 ½ teaspoon sugar and 2 ¼ tsp yeast. Mix and let sit until frothy (10 minutes). Add the dry ingredients (wheat flour, all-purpose flour, salt) to the yeast mixture and mix well. I add the salt after the flours because when I used to use my bread machine, they advised against putting the salt directly with the yeast so to be safe, I follow that same guideline in my non-machine bread as well. Add oil, syrup, 1 cup of water and knead 6-8 minutes in stand mixer or 8-10 minutes by hand. Place dough in well oiled container (I just use a paper towel to rub olive oil around inside a bowl). Cover with towel and let sit for 1.5 hours or until doubled. I find that this, as with all breads, rises really well in the oven with the light on. The light provides just enough warmth to create an ideal environment for the yeast to do its thing. Punch dough down, use a Tablespoon or so all-purpose flour to help make the dough less sticky if necessary. 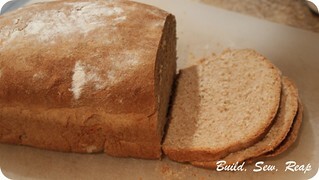 Mold the dough into a loaf by pulling the sides under, thus creating a smooth, tight top. Place it tight side up into a greased stoneware or other 9x5 loaf pan. Wet your hands with water and rub them on the top of the bread then sprinkle on some flour or oats. Cover with towel and let rise for 45 minutes or until doubled. I let this rise happen outside the oven so I can turn the oven on in about 35 minutes to let it warm up to 365 degrees F.
Bake at 365 degrees F for 35-40 minutes, or until a tap on he top sounds hollow. Cool completely before slicing. If you cut into a loaf before it fully cools, it lets a lot of the moisture escape and the bread won't be as moist the next day. If you plan to consume the whole loaf right away, there's no need to wait. NOTE: It is easier to slice the bread if it is not only fully cooled but actually refrigerated. You'll be able to get good thin sandwich-style slices.